Residential dog training courses are offered on a very occasional basis. The way in which dogs learn does not lend itself to residential training. It is often irrelevant how much time a person spends training a dog for someone else, that dog still returns to the same living environment and with the same people who have no or few training skills and no ability to impliment the dogs new learnt skills. On the few occassions concerning special circumstances that we agree to train your dog for you at our location, the duration of the course will be subject to negotiation, but will not be less than three weeks. This will be dependant on the type of dog and the problem behaviour (if any). The most important part of the course will be the lessons and the handover period once your dog has been trained. You will agree to have two lessons at your home address in the first two days after your pet is returned to you. You will have two lessons the following week of at least one hours duration each session, where the owner of the dog will attend. Members of household staff will not be accepted although extra lessons can be arranged where others may receive instructional training. 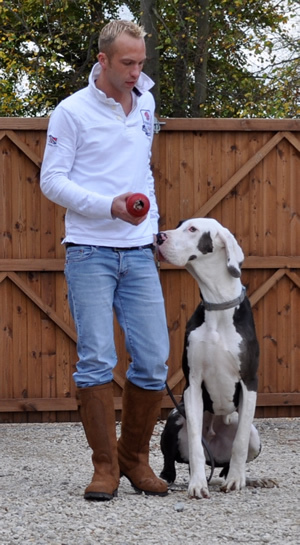 In total you as the dogs owner are required to have at least five hours (five lessons) training handover as a minimum. For the duration of the training period the dog will live in the home environment with other dogs, people, guests and normal environmental stimulus. The dogs will be exercised and trained in London’s public parks where there are many distractions present. Training in a home environment, that is as similar as possible to the dogs own residence is the most realistic training environment. Learning to respond to commands regardless of distractions is vital in all cases. Residential training starts from £2000 and is a tailored programme to suits you and your dog’s needs. View an example of a residential puppy training with Ross McCarthy and Kobe an 18 Week old Rottweiler.